Update: It appears that this dance party will be merged into the Frozen Summer of Fun Live promotion and will begin at 5:30pm at the Sorcerer’s Hat. 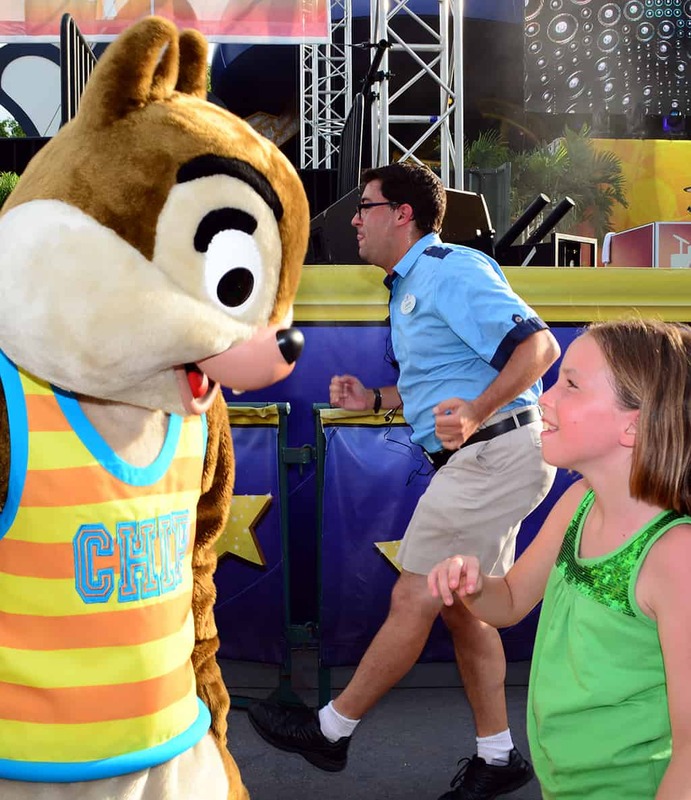 Something that seemingly appeared out of nowhere is the new “Rock Your Summer Side” Disney character dance party. It was announced on Friday and began the same day. 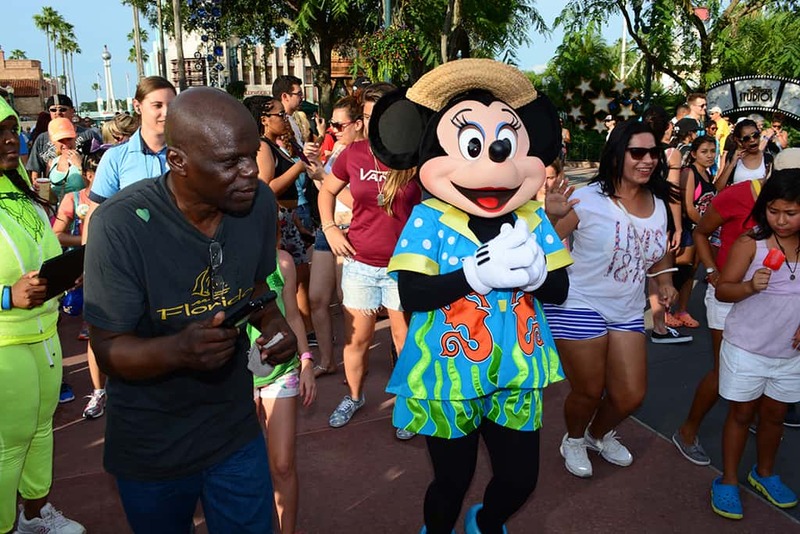 According to the press release the dance party will be offered in front of the Sorcerer Hat at Hollywood Studios until August 22nd. 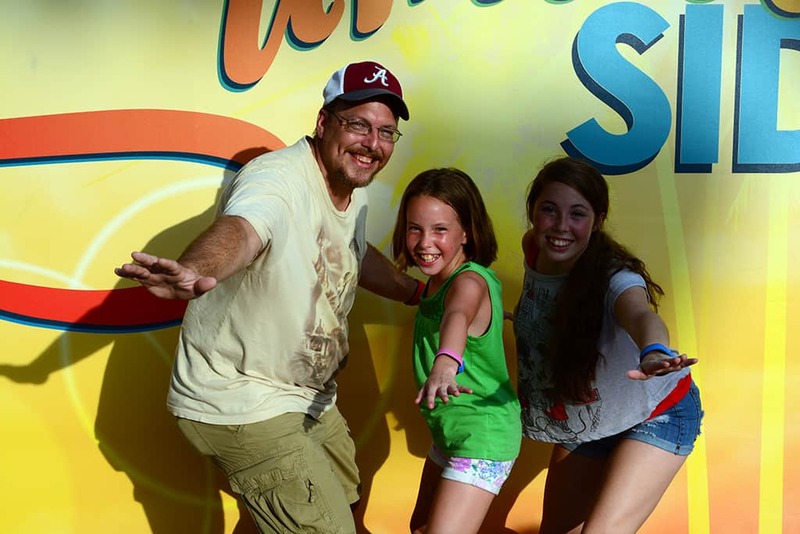 The dance party runs from 6:00pm to 10:00pm daily. 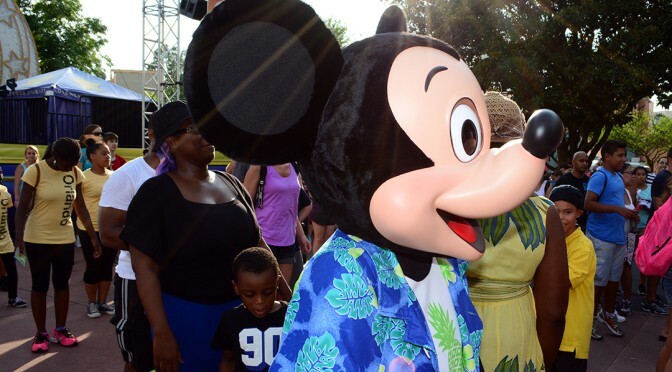 The dance party features 30 minutes of live music by Mulch, Sweat and Shears followed by 30 minutes with a DJ and the Disney characters. The characters first appeared at 6:30pm to an otherwise empty dance party area. 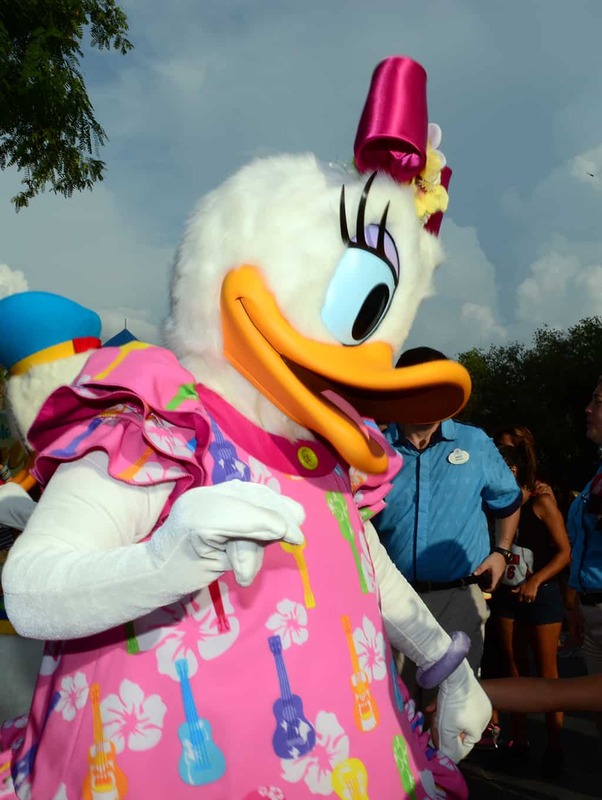 As soon as everyone saw the face below, the people in the area ran to meet the VIP characters. 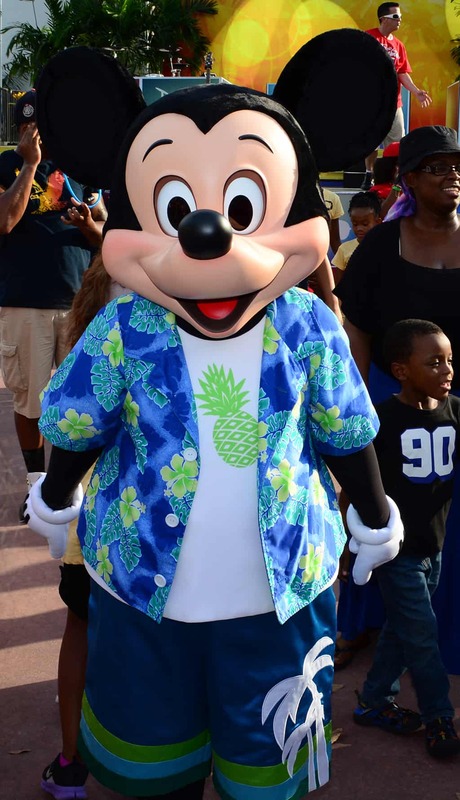 Mickey appears in his cool looking blue jam shorts, white pineapple tshirt and blue Hawaiian shirt. I was told that he and a couple other characters appear in different costumes on different days. Minnie had some sort of dance line thing going on. I’m not a dancer, so I couldn’t tell you which dance this was. 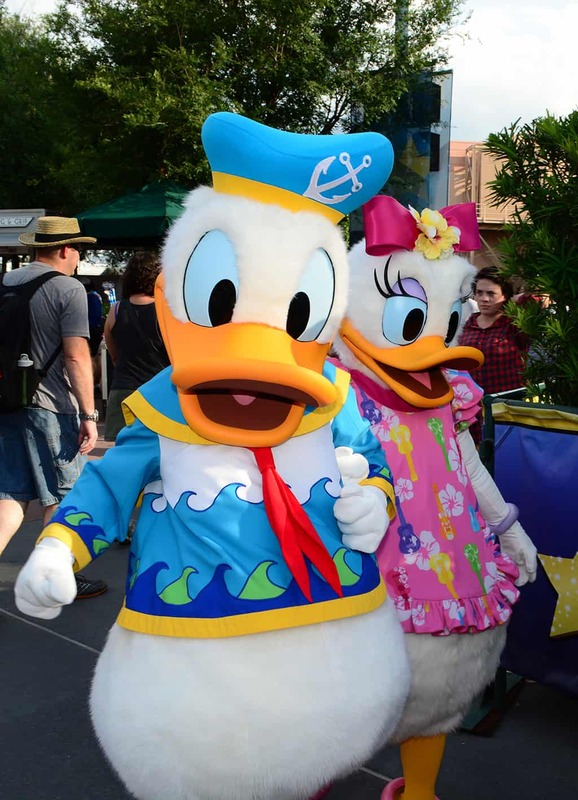 Donald appears in a fun version of his traditional nautical outfit with a wavy shirt, red tie and light blue sailor hat. 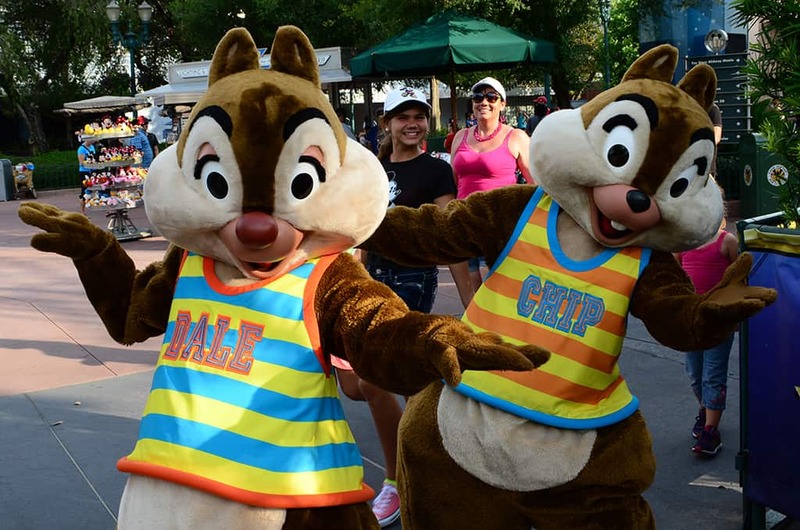 The chipmunks are wearing their swim wear to the summer dance party. I met them in these same costumes on Halloween at Blizzard Beach, but still a fun couple of guys. 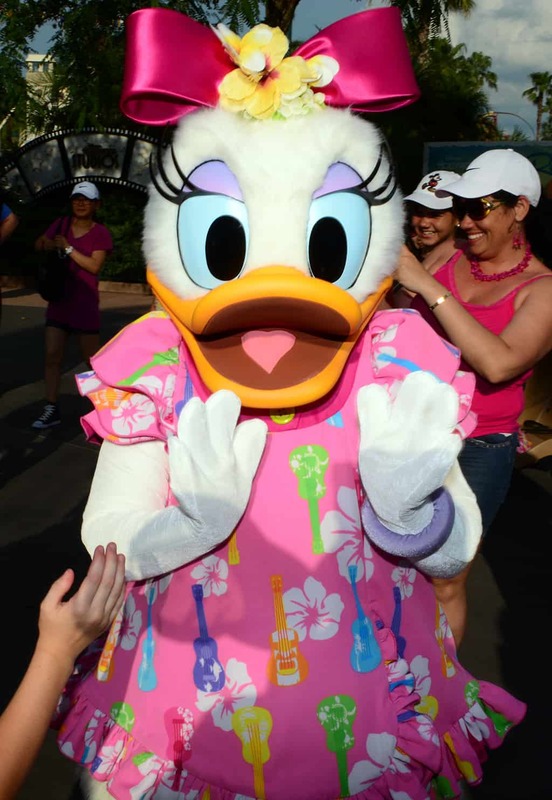 Daisy is adorable in her pink ukelele inspired dress and hot pink bow with a lovely flower. 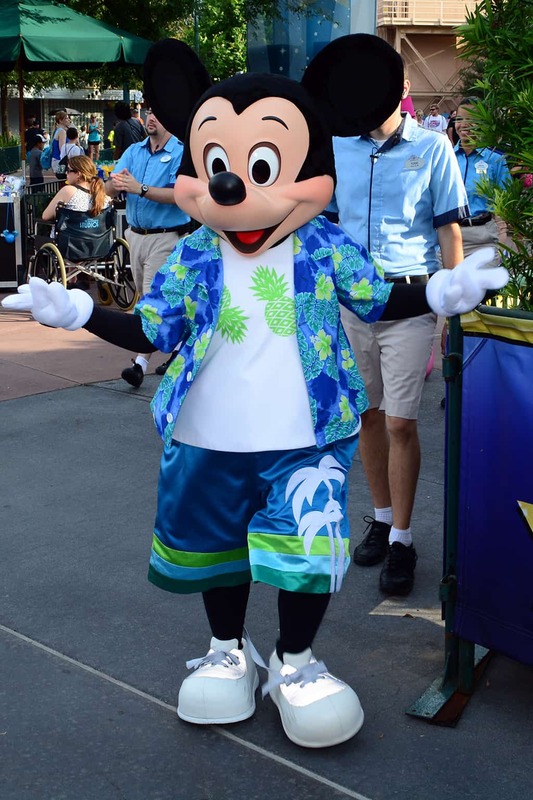 Goofy appears with no hat, an orange tshirt and blue Hawaiian shirt with jean looking jam shorts. 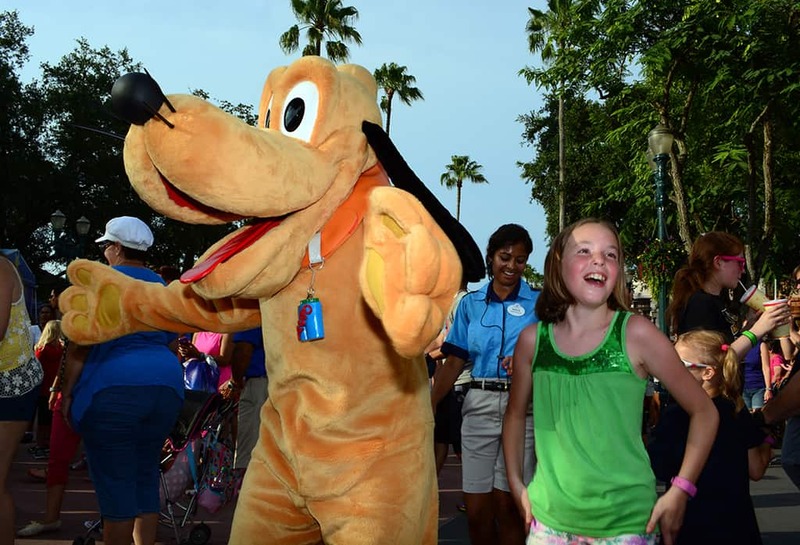 Pluto is wearing a special collar to the Hollywood Studios dance party this summer. 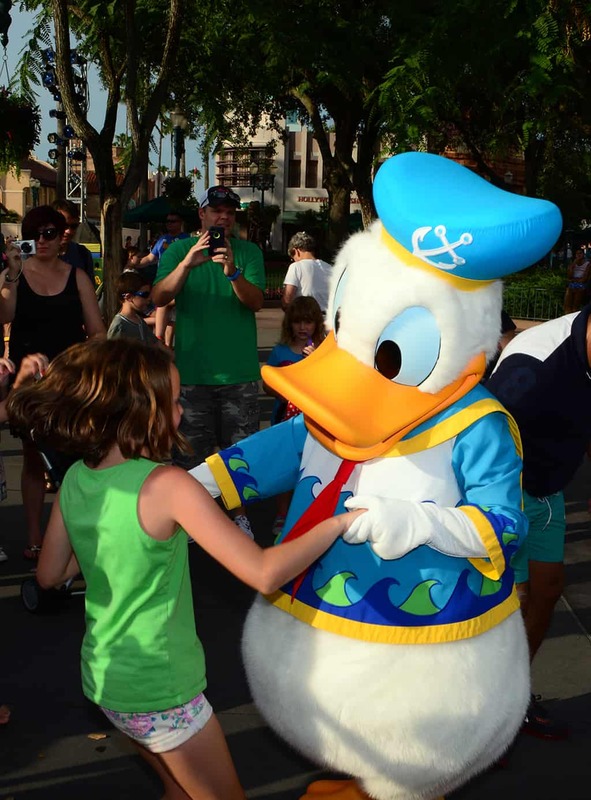 My little girl had a blast dancing with all her favorite characters. It was like 94 degrees outside in the blazing sun, so you might want to save this until 7:30pm or later in your touring to be a bit cooler out. The characters may last up to 20 minutes in the heat, but we found some leaving a little early for a bit of water, which is fully understandable. 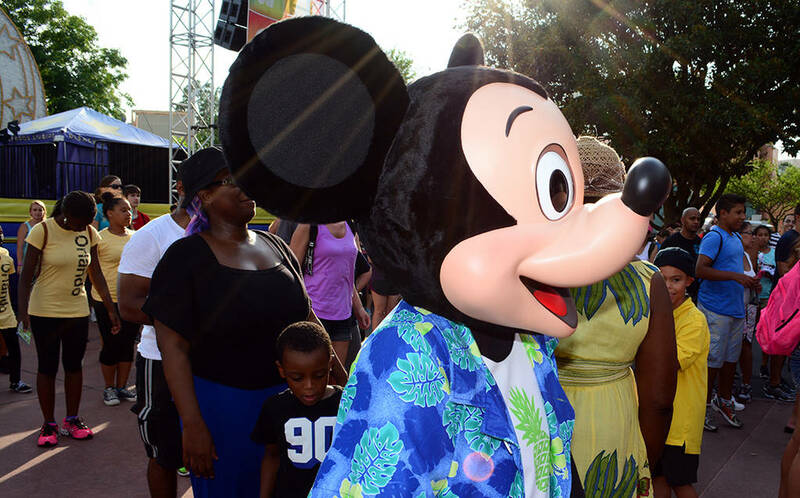 The sun glistening over Mickey as the crowd presses around him. Most people are confused when they see characters. They think they need to poke an autograph book under their nose and form a straight line. It always takes a few minutes for people to realize it’s a dance party, not a meet and greet. 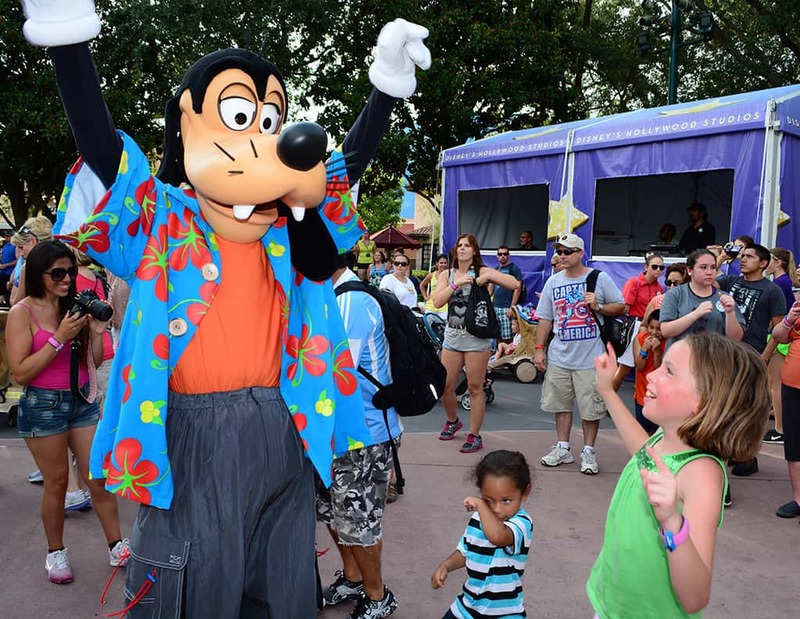 People then try to pose their kid next to the character for a shot with them as the character dances in circles. 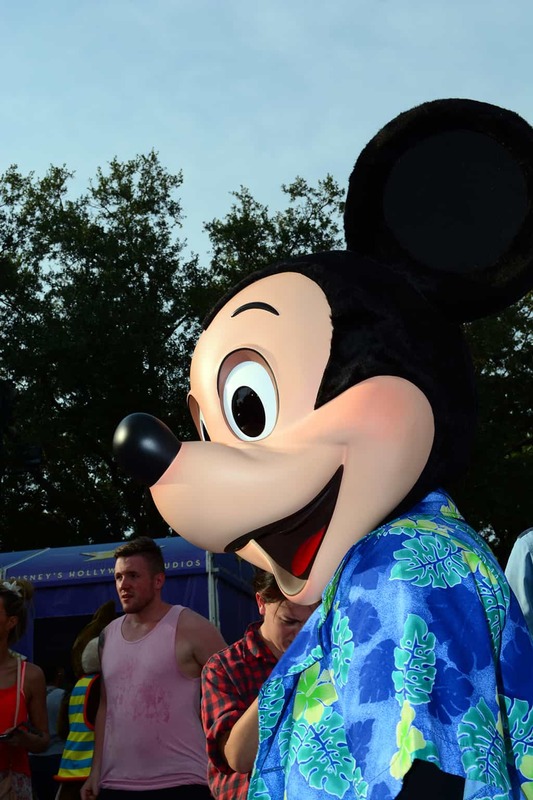 Mickey seemed happy with the new Dance party. He wanted me to tell you there are a variety of libations nearby, so you’d know you could touch your thirst while dancing your way to his bank. 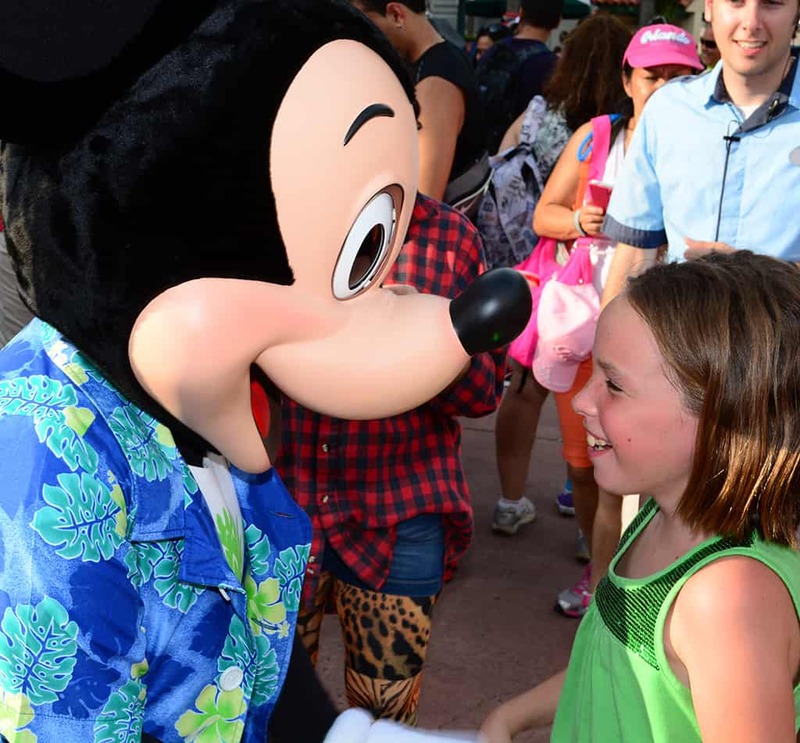 Debbie and Mickey share a moment of fun. 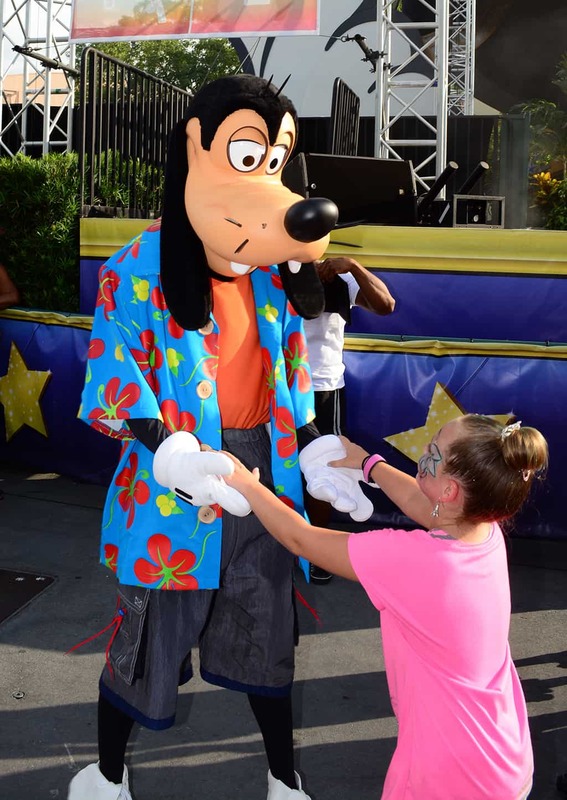 I think Goofy was trying to show her the “Crane move” from The Karate Kid. That’s the good version with Ralph Machio and Mr. Miagi, not the clutzy newer version. 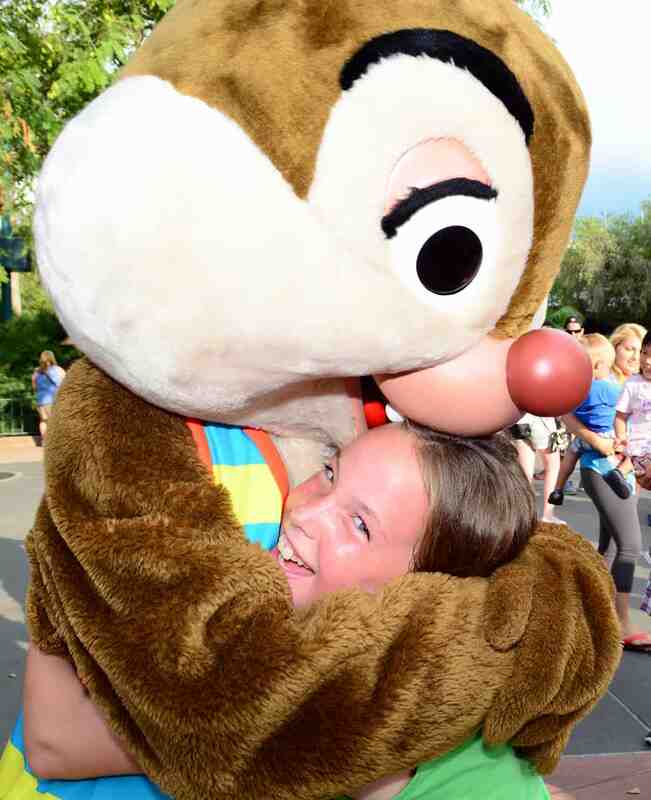 She loves characters and they love her. She gets more big hugs than anyone I know. She’s a bit of a superstar. Chip and her having a great moment. Do you see the whacky Jason in the background? He was dancing his night away. He’s such a great Cast Member. 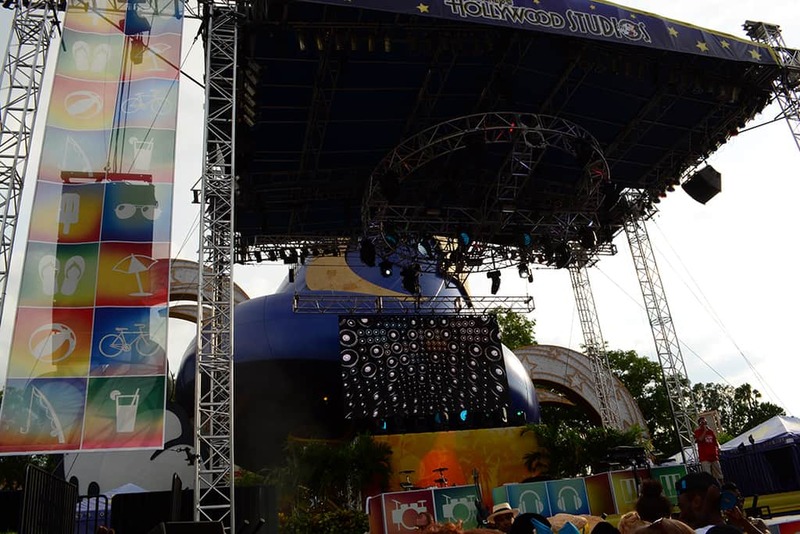 Here’s a shot of the stage. They have a backdrop to pose in front of as well. I should have turned on the flash before handing my camera over to Candace. She does a great job as a photographer and I kinda blew it by not setting the camera correctly. Will this have an impact on character palooza? So how often are they doing the party. You stated 6:30-10. Is it once during that time or more often?